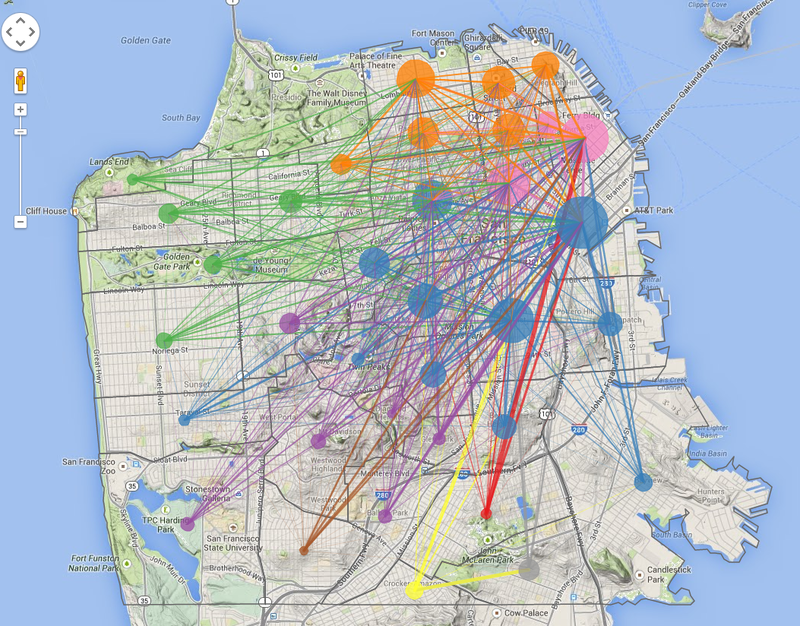 A map tracing the information flows within Uber’s San Francisco market. One of the great joys of my career is the chance to speak at gatherings of interesting people. Sometimes it’s an unscripted, wide ranging conversation (like during Advertising Week, for example), but other times it’s a formal presentation, which means many hours of preparation and reportage. These more formal presentations are opportunities to consolidate new thinking and try it out in front of a demanding audience. Last month I was invited to speak in front of group of senior executives at a major bank, including the CEO and all his direct reports. I was asked to focus my remarks on how new kinds of companies were threatening traditional incumbents – with a focus on the financial services industry, as you might imagine. Now, I’m not an expert in financial services, but I do know how to ask questions, and I’ve been watching as the core assumptions any number of markets, from media to transportation to hospitality, have been upended by Internet upstarts like Buzzfeed, Uber, or Airbnb. So I started preparing for this talk by interviewing half a dozen or so senior executives at the bank. I was prepared for defensive answers, but instead found myself pleasantly surprised – not only did these executives acknowledge a threat, they also spoke eloquently about the self-created barriers which blocked their ability to respond. Some of these barriers were regulatory and therefore out of their direct control, but many were organizational – this bank had been in business more than 100 years, and its DNA was pretty deeply set. There’s no dearth of literature and leaders with strong points of view about corporate change – Clayton Christensen’s Innovator’s Dilemma is the classic, and there are plenty of others – Downes’ Big Bang Disruption and Moore’s Crossing the Chasm come to mind. But I’ve not made my living writing about corporate disruption, nor do I expect I ever will. As much as these kinds of books lay out specific and intelligent management lessons, I didn’t want to dole out second hand advice – after all, if the banks wanted to hear that, they could have asked Christensen, Downes, or Moore. So preparing for this talk forced me to do exactly the kind of hard work any writer both fears and relishes – coming up with something original to say. So I started to think about why it is that large enterprises fail to innovate. What was it about new, digital companies – which I’ve come to call “NewCos” – that allows them to so quickly pose significant threats to the incumbents in their respective markets? It struck me that corporations – which by US law enjoy the status of personhood – act much like organisms in biological systems. Some are fitter than others, and every so often you see punctuated equilibrium – a quick reset of the ecological landscape. Further, it struck me that we’re in the midst of such a phase shift as we become information – a theme I’ve written about quite a bit (and the core thesis of my long-unfinished book). That got me pondering the role of information in companies. I wondered, what is the role of information in biological systems? A bit of Googling reminded me of living systems theory, which I last encountered reading Kevin Kelly‘s What Technology Wants, which posits that technology itself is a living system. But I found myself pursuing a narrower path: What if we understood corporations as living systems? Might there be an insight or two to gain? Bingo – there it was, right in front of me – a new way to think about corporations. The first thing that struck me in this definition was the use of the word “open” – most large enterprises are not open in most senses of the world. But most interesting was the framework of understanding flows of information, energy, and matter in a corporation. Immediately, I came up with a hypothesis: most corporations are organized to maximize their use of energy and matter, because those are the most expensive parts of their businesses. NewCos, on the other hand, place information at the center of their business. Put another way, NewCos are “information first” companies. They map the flows of information in a market, and organize themselves so as to exploit or leverage those information flows, even if the flows are “potential information” – information used in a new way, a manner which may be more efficient, productive, or valuable. Put information first, and let that determine how best to organize energy and matter. Industrial era-companies, on the other hand, value their hard assets first (energy, matter), and only view information as a way to organize or protect those assets. I’ve been wandering the halls of theory for a while here, so some examples are in order. I’ll start with everyone’s favorite disruptor, Uber. What has Uber done? Well, it’s stared long and hard at the information flows of the transportation business, and it’s created a service that re-imagines how, by leveraging information flows, it might go about more efficiently organizing the energy (people, gasoline) and matter (automobiles, roads) in that market. Uber is an information first business, whereas taxi commissions, rental car agencies, and even automobile manufacturers are energy and matter-first businesses. Or let’s look at another market: hospitality. Hotel companies are energy and matter-first businesses – they look at the world as a collection of places where expensive hotels might be built, and they then spend a lot of energy and money convincing the market to come to their hotels. Airbnb focused on information flows first, and created a new approach to organizing the energy and matter of the hospitality market: it uses information to organize people (energy) and matter (people’s homes). Once I started thinking about companies as either “information first” or “energy and matter first,” I began to see information first companies all over the place. This wasn’t hard, because I’ve been spending the past year looking at applicants for NewCo festivals around the world. GrubHub, for example, takes an information first approach to take out dining. Casper takes an information first approach to the design, manufacturing, sales and delivery of mattresses. DocuSign is obliterating paper with it’s information-first approach to trusted signatures. Hampton Creek is a classic information first company in food. On and on and on – the theory is perhaps too neat, but neat it was nevertheless. Then I wondered – what are the information first companies in financial services? After all, I needed to bring this theory home with a strong example native to the folks who I’d be speaking to. And that’s when I remembered Earnest, a NewCo I had visited during our San Francisco festival. And man, does Earnest bring the point home in spades. 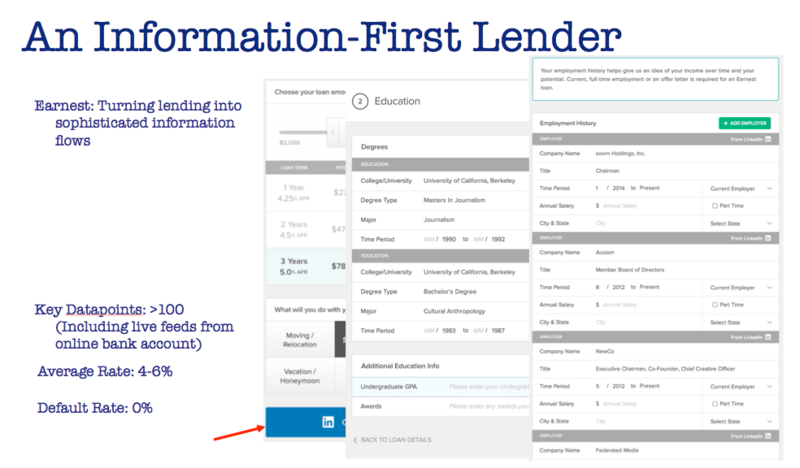 In my talk to the bank, I laid out how Earnest’s “information first” approach allows it to entirely rethink the lending landscape. First, I explained how Earnest works: It builds an information-rich profile of a prospective lending client, using APIs from LinkedIn and the client’s own bank account. In his NewCo presentation, Earnest CEO Louis Beryl explained that the company uses more than 100 parameters of information to make a lending decision, and models that information against ever-more intelligent algorithms. It’s a process that is familiar to every information-first company, from Google to Uber, GrubHub to NetFlix. Let’s compare Earnest’s information-first approach to the traditional lending practices of most US firms. 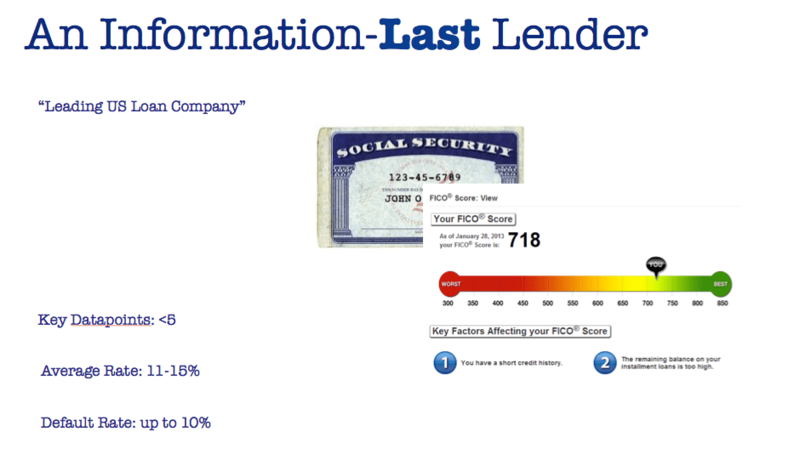 These companies lend money based largely on an outsourced information source called the FICO score. As you can see, these businesses are built on a relatively thin information flow – and most of it is outsourced to another company (FICO). Lenders tend to organize around three things: Lead generation (marketing cost), conversion (to a loan), and collections. Defaults are a cost of doing business. But Earnest’s approach focuses on identifying qualified clients, then servicing them in an information first manner. While still new, Earnest’s approach radically changes the game – it charges 50% less for a loan, and has no defaults to date. Time will tell if Earnest executes its game plan well enough to become a major disruptor in the financial services sector, but the company’s already convinced Andreessen Horowitz and several other major VCs to invest $15mm in its first round of financing. This post represents my first “thinking out loud” about what it means to be an information-first company, and it’s in no way complete. The concept isn’t original per se, but I think might add some structure to the terminology that has bedeviled our industry for years. So often we talk about “tech companies” who “leverage big data” to “disrupt” incumbent players. I like the idea of calling these businesses “information first” companies – because in the end, any company can put information flows first. Get that right, and the energy and matter will follow. Interesting to see you thinking about this. Came up in my google alerts. We are currently working on some similar theories and (later on) an open source software (issue based information system). It is an open project with all information available on the website! Would be great to hear your thoughts. Just get in touch. A real challenge for most corporations today – managing to adjust their internal values and systems. Firms spend years building operational efficiencies with a process view that deploys very little else into competitive strategy – about being different or innovating (Michael Porter). What your thesis above points out to me – how truly susceptible entrenched businesses are today; you never know whose just around the corner and ready to move the battle away from your comfort zone. Earnest is a great example of a company that understands the future; drives value by lowering fees and bases decisions on the borrower’s behavior and not solely on an outdated math score.